What are your names? / Who plays what? / How old are you? Our names are Silvia ( 44, double bass / electric bass ), Eleonora ( 26, vox and conduction ), Paolo ( 23, trumpet ), Matteo ( 22, tenor sax ), Federico ( 22, piano / keyboards ), Francesco ( 28, electric guitar ) and Palmiro ( 23, drums ). Have you had other previous members? No, but during the last accademic year an alto sax player named Lasha played with us for a while. Where are you from? We met in Siena ( IT ) but we went from different places around Italy: Silvia ( Siena ), Eleonora ( Francavilla, Puglia ), Paolo ( Larino, Molise ), Matteo ( Florence ), Federico ( Pisa ), Francesco ( Lucca ), Palmiro ( he was born in Calabria, but he lives near Siena ). What inspires you? Sly & The Family Stone, of course, but also a lot of jazz musicians and improvisers. How often and where do you reherse? We're trying to make it happen once a week every month. Usually we reherse in Siena. Are you looking for a booking agency, and what are your thoughts around that? Yes , of course we are, it would be great. What made you decide to make this music? Silvia's idea. She was our teacher at Siena Jazz University and she liked Eleonora's voice, so powerfull and soulfull, she came up with the repertoire that really worked out. It was kind of unexpected and lots of interplay came out through this music. Silvia was pretty happy about that and we decided to keep the band alive after the end of the academic year. Have you done any covers live? We are not a tribute band, so we never cover 100% Sly's tunes. Silvia came up with some arrangment, with some free stuffs in the middle, so is not a real cover, is more ri-arranged, with a lot of impro inside. We like to call it "our homage to Sly's music". Do you always play the same songs live, or do you vary? Until now we have played the same songs each time, but it is always different because of the free / impro stuffs. Do you have a regular place you play live often? Unfortunatly not, it would be great. That's not common in Italy. What was your first gig like? It was pretty cool. 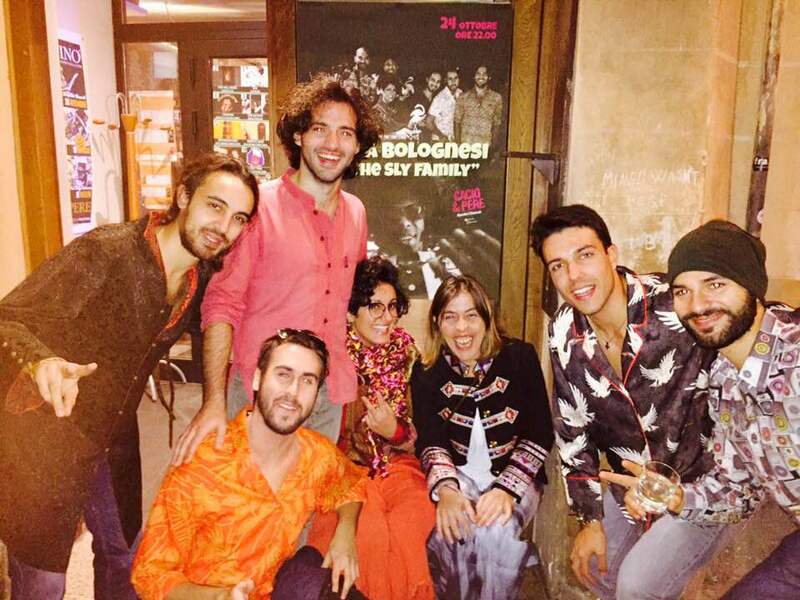 We wear crazy funky jackets and we felt very excited to play those tunes in front of an audience, but at the same time most of us where scaried because of Silvia ( ahahahah ). She's pretty known as a musician, we were ( and still ) at our first great collaboration with a great artist, so it was not so easy, but then we played and everything turned out good. What was your latest gig? It was in Siena at UnTubo. Where have you played live this year? Different locations in Tuscany. Where do you plan to gig the comming year? We don't know ( ahahah ). We would love to play abroad. What do you think of my work? It's nice. You talk about rising bands that want to expand their name outside their country. It's a good way to promote young musicians, like us, and obviously to grow connections. How do you think and know that this interview will help you in the music business? We don't know. It's a good opportunity to us. We might be notice abroad, get some gigs. It's gonna be nice that you'll talk about us in your blog too. How can people reach? By the FB or by our SparkAdobe page. They can fid our e-mail address into both of them. What are your plans for the future? Play, have fun, Funky !!! Do you have something to add? Thanks a lot for your time, it was a pleasure. Can't wait to read the aritcle.